CHUNGBUK, SOUTH KOREA, January 5, 2015: An advanced extrusion coating die designed to reduce edge bead has enabled one leading producer of aluminum foil and foil-laminate flexible packaging to actually eliminate edge bead, as well as reducing coat width variation by half or more, it was announced today by Nordson Corporation. After a die for applying LDPE on an existing production line for flexible food packaging had been causing problems with die lines and leakage, Korea Aluminium Co. Ltd. recently replaced it with the Nordson Extrusion Dies Industries Edge Profile Control (EPC™) die. The new die has not only eliminated the previous problems but has also made it possible to address the issue of edge bead and the waste of coating and substrate material that results from it, according to Mr. Jeonghyeon Heo, senior manager of Korea Aluminium’s headquarters facility in Chungbuk. 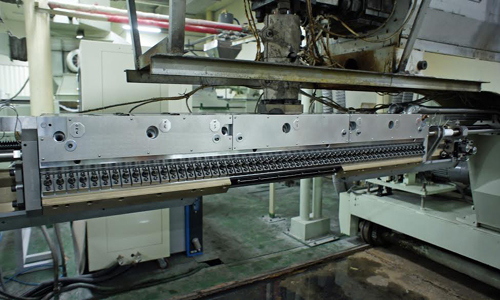 While the degree of edge bead reduction achievable with the EPC die depends on a number of factors, the reduction in the Korea Aluminium coating line was 100%. “We are now manufacturing product with zero edge bead,” said Mr. Heo. Nordson Extrusion Dies Industries is represented in South Korea by Dae Joo Ind. Co., whose president is S.J. Kang. Nordson field service agent Andy Svenningsen traveled from the USA to provide on-site startup support for Korea Aluminium, and Chooni Kim, senior sales manager for Nordson in South Korea, supplied technical recommendations for enhancing coat weight uniformity. An EPC die includes an external deckle as a secondary seal to prevent leakage and an internal deckle system that sets coat width and seals polymer at the die exit. Internal deckle parts provide independently adjustable components that seal off the internal flow channel and can be positioned to set the overall coating width and to minimize edge bead. Similarly, a manual or automated system for adjusting a flexible lip of the die makes it possible to maintain coat weight uniformity. Internal deckle systems used for fine-tuning the edge profile of a coating are effective because of the tendency of molten polymer to exhibit transverse flow if lateral barriers to flow are removed at the die exit. In the EPC die, the internal deckle components for adjusting the edge bead profile are located upstream of the lip land—one in the primary manifold section, the second in the preland area. By adjusting the positions of these components relative to the deckle rod, it is possible to reduce the flow of polymer at the extreme edges of the coating, thereby minimizing edge bead.